Heroes arise from everyday life. Supernatural and powerful forces lead the ordinary person to perform wondrous deeds, often bestowing good upon their fellow man. Metropolitan Museum of Art. 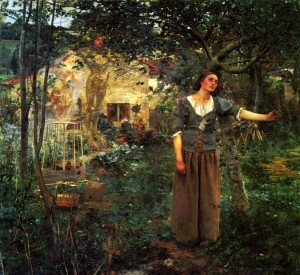 Joan in her garden receiving messages from the saints. Joan of Arc’s story is one of those rare events in history which actually happened! The seventeen-year-old illiterate farm girl from eastern France disguised herself as a man in her war campaigns against English oppression. Joan claimed she heard voices from a trio of saints telling her to deliver France from the English. Captured in 1430, Joan was tried for heresy and burned at the stake. Five hundred years later, in 1920, Joan of Arc was made a saint. 200 years ago a poor black woman, Harriet Tubman, was born into slavery in Maryland. In spite of a childhood of hardship and deprivation, she emerged a hero battling this tyranny. She escaped her master 12 years before the Civil War and fled northward with the help of the Underground Railroad. Tubman persevered in helping other slaves find sanctuary in northern states and became a hunted woman in the South with a price on her head. Gone: An Historical Romance of a Civil War…, 1994. Contemporary artist, Kara Walker, shatters any romantic notion of the South, Civil War or slavery. 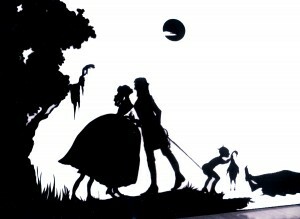 Walker cuts out huge life-size silhouettes in black paper…nightmarish images of slavery in the Antebellum South. 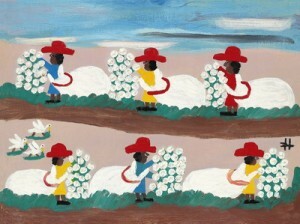 Watch this video of Kara Walker’s Civil War art. Ickkk …. Probably the very response artist Walker wanted!! Recognition and tribute for two real heroes. Their important roles affected and benefited millions. Their artful portrayal will help us remember how one person can make a difference. Kirby, Only a creative mind could conceive of juxtaposing Harriet Tubman and Joan of Arc–recognizing them both as heroes. In her own insightful manner, Kara has utilized her scintillating silhouettes to make a lapidary statement about the scabrous, non-heroic side of the un-civil Civil War. Thank you for sharing your perceptive perspective w/ those of us who are much more pedestrian. Very thought-provoking, Kirby. I am enthralled by these two legendary women. What other heroines did you consider? Intriguing question, Judith! Immediately, three women come to mind. 1. Betty Ford for courageously bringing breast cancer & addiction and their treatments out of the darkness & into the light. 2. Donna Frye, a San Diego politician who just this week risked her political career & party support by exposing to the public our mayor’s unbelievable sexual harassment behaviors, 3. Rose Mapendo, a Congolese Tutsi woman who endured atrocity & is now ardently speaking for her people.